Man is a social being and after meeting his basic requirements, he needs to communicate with others. From ancient times, he tried to develop various means of communication in which time to time he got success. In the modern time telephones are invented and now we have mobile phones in hand, which are the latest forms of telephones and the modern means of communication. But the mode of this communication is now changed. Now a days mobiles turn out to be the most popular gadgets of entertainment. It has become a benchmark of fashion statement. Now mobiles are the valuable and cost effective electronic gadgets of modern times. Karbonn mobile is one of the leading and cherished brand in India today and have turned at the forefront of ushering in the revolutions of modern mobile industry of India, claiming as the established mobile handset brand in the country. Karbonn mobile is one of the fastest growing telecom company in India which is a joint venture of Bangalore based United Telelinks Limited and Noida based Jaina marketing and associates. The company has contracted with different semi-conductor companies for their handset selling throughout India. There are 500 official service centre are scattered all across the country. The Karbonn products ranges from well-equipped Smart phones and tablets to GSM, CDMA Dual core processor featured phones. Taking mobile technology to the doorsteps of the people, not just in India but also in abroad, Karbonn mobiles have been hugely applauded by the consumer as well as by the stakeholders. Being a symbol of Indian robustness, Karbonn mobiles emphasizes on its qualitative traits which are splendid. Heralding a new era of connectivity Karbonn mobile has infused a new life to the mobile Industry. The Karbonn A4 & A6 is an entry level smart phone that comes with the range of some beautiful feature. This smart phone is Ideal for the users those who wish to buy a low cost Android smart phone with decent features in it. These devices are also Dual Sim enabled. The latest Karbonn mobile model of A4 is embedded with the number of good functionality and it is very cost-effective handset. It comes with a 4 inch display screen that offers a fantastic visual. It comes with a simple bar shaped design and it features a1400mAh battery in it. This smart phones runs on Android 2.3 Gingerbread OS, and it is powered by 1 GHz single core processor. The Karbonn A4 also has 256MB RAM for smooth multitasking. The Karbonn A4 has 3.2 MP primary camera for capturing images and videos. A 0.3 MP VGA secondary camera is also available in this handset for video calls. This handset has 512 MB internal memory and it is expandable further by up to 32 GB.there are other ordinary media functions preloaded in this device. This includes FM radio, media players, games and social networking apps etc. A range of connectivity features are available in the Karbonn A4 including 3G, Wi-Fi and Bluetooth etc. Karbonn A6 is a Dual SIM phone, running on Android Ice Cream Sandwich platform. It has a 4 inch WVGA capacitive touchscreen. Wi-Fi, EDGE, and GPRS are there for Internet connectivity; Bluetooth and USB help in faster data transfer. There is a 5MP camera on the back side of the body and a VGA front camera is there for video chat and self portrait. The 1450 mAh battery of the handset provides users with ample talktime and standby time. Other features include FM radio, audio and video player, 3.5mm audio jack, and 32GB expandable memory. Grab fashionable and features studded Karbonn A4 and A6 mobile phones immediately. 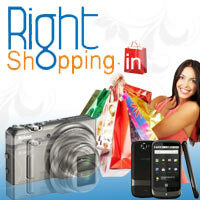 RightShopping.in is the online address where you can find these models that are available in reasonable prices. Enjoy the online shopping benefits through www.rightshopping.in that will allows you to connect with your dear ones at any time.